This is a really great photo. I like it. Berlin is still on my to-do list. 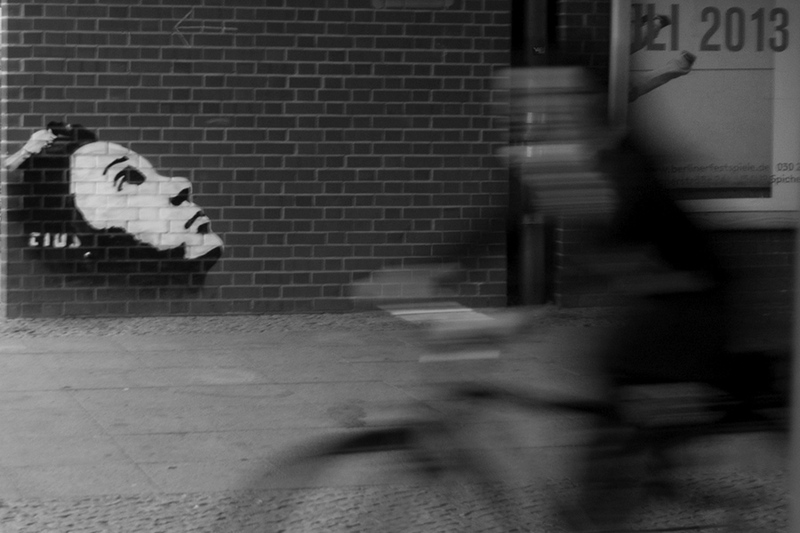 Great shot, love the movement, and the juxtaposition of the face on the wall with the blurry face of the bicycle rider. stillness and dynamics running into each other! nice pic! neat. the art has a clear face but people, no. This is a really great shot! Great photo with face on the wall and fast moving bicycle. I like the contrasts you present. Excellent timing. Well seen and beautifully shot! What a excellent photo! You did really a great job! Hehe, herlig! Kunne fort gått i søpla et slikt bilde, men det er om å gjøre å se potensialet! Veldig kult! I like your take on this.. terrific shot! Nice shot. Both still and motion. This is perhaps my favorite. The person on the bike is passing by street art of a person looking up. Too many times I feel people forget to look up and realize how amazing the planet is, instead we’re busy rushing by, forgetting to notice beauty in the things around us. Mittened Hands, your usual outstanding quality! Really nice picture, well done!